Tucson Truck Driver Error Lawyers, Trucking Accident Attorney | Russo, Russo & Slania, P.C. Because large trucks are significantly larger and heavier than passenger cars, truck accidents can have far more devastating outcomes than regular car accidents. In fact, as speeds increase, the likelihood that victims in smaller vehicles will survive truck accidents greatly diminishes. When trucks are hauling flammable liquids, catastrophic outcomes are likely to affect more than one driver. Accidents that lead to serious injury or death can cause lasting physical, emotional, and financial pain in their victims and their families. When there’s nowhere to turn, Russo, Russo & Slania, P.C. will be waiting to help. Our deep Tucson roots, which trace back to 1956, combined with decades of litigation experience, make our firm the logical choice for victims and their families who need compensation for injuries and suffering caused by truck driver negligence. Involved in a truck accident by no fault of your own? Need superior representation to overcome insurance or trucking company bullying? Contact our Tucson truck driver error attorneys to schedule your free consultation today at (520) 529-1515. Any action that takes the truck driver’s eyes off the road, or any method of mishandling or misusing their truck, may be considered truck driver negligence. To be considered negligence, you will have to demonstrate that the truck driver violated the standard of care they owed to you, that their violation directly led to your injuries, and that your injuries caused you significant damages. Fumble around their seat looking for food, CDs, or other items while driving. If drivers of passenger vehicles can be held liable, truckers can, too. Fatigue is more common than other types of negligence as many companies incentivize early deliveries or pay premiums to drivers willing to log extra hours. Fully loaded trucks with 53’ trailers can exceed 80,000 pounds. Mix that amount of weight with negligent operation of a driver’s truck, and fatalities are likely. Unlike passenger cars where there’s one insurer to battle in court, truck drivers have their company, the company’s legal team, the insurer, and their legal team on their side. That’s four entities with a vested interest in not paying your claim. In some cases, you’ll meet with all four at once. A proficient truck driver negligence attorney knows their way around trucking laws. They know what games insurers will play. They’ve dealt with situations like this hundreds of times before. Trucking companies and insurers pray that victims will battle them without counsel because they know unrepresented victims will get eaten alive in court. Lawyers are also skilled negotiators. They know the first offer insurers make is likely to be far too small. They can provide the necessary evidence to prove that the truck driver was negligent in order to improve the offer dramatically, and will not be afraid to take your case to court if the insurance agency still refuses to budge. Left to their own devices, accident victims usually receive significantly smaller settlements that cannot pay for all their future expenses they will likely face. 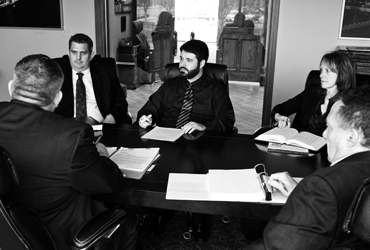 At Russo, Russo & Slania, P.C., our practice is large, experienced and under no pressure to settle cases quickly. Because we have separate divisions feeding one practice, we’re able to finance the costs associated with litigating truck driver negligence cases and maximize our clients’ compensation without worrying about making payroll. We’ve put our clients first since day one. When they’re hurting and scared, we’re there to fight the many injustices committed by insurers, truck drivers, trucking companies, and any third parties to your accident. Russo, Russo & Slania, P.C. wants their clients to concentrate on healing from their injuries so they can return to normal life. Put you and your family in the greatest possible position by hiring our aggressive firm who will fight until you’ve been compensated for your losses. Recognition errors. When drivers are distracted, their attention is taken away from their driving. Our firm handles claims where cell phones, computers, texting, eating, and other common distractions caused the truck driver to lose sight of their driving duties and fail to recognize hazards. Decision-making errors. Truck drivers who are overly tired or are rushing to make their drops will speed, tailgate, or drive erratically. Russo, Russo & Slania, P.C. frequently takes cases where drivers simply lost their ability to drive reasonably. Performance failures. Seizures, drinking alcohol, consuming illegal or prescription drugs, falling asleep while driving, and other types of physical impairment will cause drivers to lose control of their big rigs. Accidents that fall into this category happen far too frequently in Arizona, and our firm litigates these fiercely. General unsafe driving. Overcompensating turns, poor directional control, and other errors where the driver simply cannot maintain safe control of their semis can cause accidents, and we’re there to fight them in court. If you are unsure what caused your truck accident, do not worry. At Russo, Russo & Slania, P.C., we can conduct an independent investigation of your crash to determine the cause and identify the liable party. For over sixty years, we’ve provided victims living in Tucson and surrounding cities superior legal representation in cases where truck drivers made catastrophic errors on the road. From the first day we have your case, until the day we settle your claim, our firm will work tirelessly to uphold your rights. We’ll negotiate the fairest settlement and take into account pain and suffering, lost wages, medical bills, potential loss of future income, and all other calculable and non-calculable losses when discussing what you deserve. Arizona has a strict two-year statute of limitations for filing claims. Don’t wait until the last minute to fight truck driver negligence – call our truck accident attorneys at (520) 529-1515 to schedule your free consultation today.